Lufthansa canceled 800 flights from Monday to Thursday as the pilots of Europe's largest airline by revenue walked off the job. 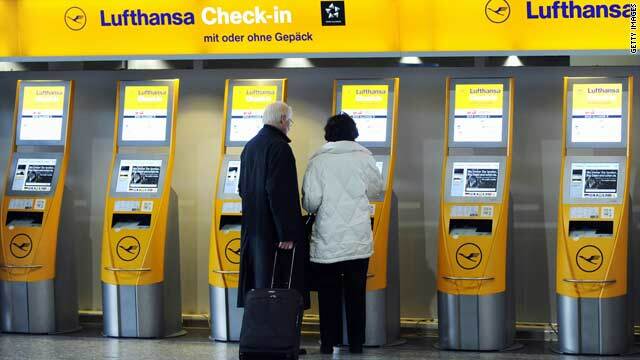 Frankfurt, Germany (CNN) -- Lufthansa said late Monday that the airline is keeping its strike schedule in place for Tuesday, despite the fact pilots had already suspended the strike. "It will obviously take a few days until we are back to normal," spokeswoman Claudia Lange said. The airline is planning to fly about 1,000 of its normal complement of 1,800 flights, "plus, where we can, single, additional flights," she said. The announcement came shortly after both sides in a pilots strike against German-based Lufthansa, one of of the world's largest airlines, agreed to suspend the standoff beginning at midnight (6 p.m. ET) Monday. The suspension will expire March 8, barring an agreement before then, both sides said in a Frankfurt labor court. "The judge was very clear," Lufthansa spokesman Klaus Walther said. "He recommended the union to stop the strike action and to return to the negotiation table." Walther predicted the two sides would reach a final agreement "pretty fast." The pilots' union previously had said resuming a normal schedule would take time, because the union had to inform striking pilots of the agreement before they could return to work. In addition, passengers whose flights have been canceled will have to be rebooked. Hundreds of flights were canceled Monday. The walkout by more than 4,000 members of Vereinigung Cockpit, the pilots' union, began at midnight Sunday after a last-ditch effort at negotiations over pay and job security failed, the company said. The strike threatened to disrupt travel on more than two dozen partner airlines, including United, US Airways and Continental. In 2008, Lufthansa was the No. 2 international carrier, with 42.2 million passengers, according to the International Air Transport Association. The industrial action was the largest in German aviation history, Lufthansa said, and it signaled growing labor unrest across Europe. Hours after it started, the union representing most of British Airways cabin staff voted to strike, but did not set a date. On Wednesday in Greece, a mass public and private sector strike is planned to protest the government's austerity plan. In addition, French civil aircraft staff, including air traffic controllers, said Monday they plan to strike Tuesday through Saturday. Four unions called for the strike, denouncing a government project to merge air traffic control operations with those of five other European countries -- Germany, Belgium, Netherlands, Luxembourg and Switzerland, according to Eric Heraud, spokesman for France's civil aviation authority, DGAC, or Direction Generale de l'Aviation Civile. The unions are afraid of dismantling DGAC, Heraud said. Under the new proposal, "nothing will change geographically," he said. "The control towers will stay where they are." Only the "map of the sky" will change, or the sphere of the controllers' concern, Heraud said. Half of Tuesday's flights at Paris, France's, Orly airport were to be canceled because of the action, he said. Twenty-five percent of the flights at Charles de Gaulle Airport were to be canceled. The labor unrest comes as the airline industry is digging out of the worst one-year drop-off in business, according to International Air Transport Association. "It is the kind of death throes, I guess, of the very strong legacy airline unions," said Simon Calder, a travel expert. "Now, all the old airlines like BA, like Lufthansa, are struggling" to cut costs, he said. In 2009, air carrier revenues dropped nearly 15 percent worldwide after a record $535 billion the previous year. Passenger travel fell a record 3.5 percent and freight fell more than 10 percent, according to International Air Transport Association figures. Many of Lufthansa's pilots have been working without a contract since March and more than 90 percent of the union's members had voted to strike, a union representative said. The union, which is seeking a 6.4 percent pay increase, is also concerned with the airline's recent buying spree of small regional carriers, such as BMI and Austrian Airlines, a practice that it said cannibalizes flights from union-flown routes. Lufthansa is one of the largest carriers on the Star Alliance, a network of 26 airlines that share ticketing and routes for international travel. Other Star Alliance member airlines are: Adria, Air Canada, Air China, Air New Zealand, ANA, Asiana Airlines, Austrian, Blue 1, BMI, Brussels Airlines, Continental Airlines, Croatia Airlines, Egypt Air, Lot Polish Airlines, Scandinavian Airlines, Shanghai Airlines, Singapore Airlines, South African Airways, Spanair, Swiss, Tap Portugal, Thai Airlines, Turkish Airlines, United Airlines and US Airways. CNN's Frederik Pleitgen, Erin McLaughlin, Stefan Simons, Kevin Voigt, Alix Bayle and Greg Morrison contributed to this report.